WCCS Weatherization assists income eligible Warren County residents reduce energy costs by improving the energy efficiency of their homes thus creating more affordable housing for those most in need. 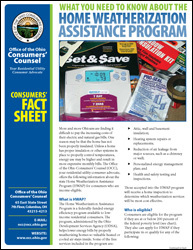 Income qualified homeowners and renters may receive this service if they meet the guidelines. WCCS has been serving the weatherization needs of Warren County since 1975. Wrapping hot water heaters, pipes etc. Filling holes around plumbing with foam. Sealing return air/supply ducts coming into the home, if accessible.